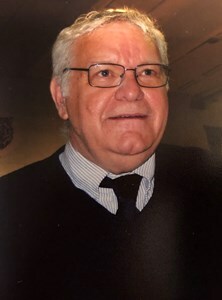 Calvin F. Knaide IV, 73, of Green Bay, beloved husband of Lori (Uphill) Knaide, departed this life peacefully with family by his side on Monday, March 18, 2019 at Odd Fellow Nursing Home. Cal was born on September 28, 1945 in Bangor, ME, son of the late Calvin F. Knaide III and Dorothy (Woods) Knaide. In his early years he worked as a Police Officer with the City of Bangor, following a long line of family officers. He came to Wisconsin and obtained his Masters Degree in Education. He met his wife Lori and they were married on June 6, 1980. Throughout his career he taught drivers education, physical education, mine safety, as well as many volunteer activities. While teaching he was an Assistant Football Coach and Cross Country Coach. He also worked for the American Red Cross as a Hurricane Disaster Relief Coordinator. In his spare time Cal enjoyed wood working, painting, wood burning, swimming, and biking. He is survived by his wife Lori, and 6 children: Calvin F. Knaide V, Tamara Holder, Christopher (Mahala) Coshenet, Brian Coshenet, Stephanie (Haji) Johnson, and Aaron (Candy) Knaide. He also leaves a sister, Marjorie Knaide, along with grandchildren: Calvin VI, Vanessa, Cahmon, Tacoda, Aysha, Josephine, Loriann, Sebastian, Leanna, Mason, Kendra, Logan, and Brianna. Cal also leaves great grandchildren: Onyx and Arya, along with numerous extended family and friends. He is preceded in death by 2 sisters, Carol and Debbie, and a brother, Shawn. Visitation will be held on Saturday, March 23rd from 9 AM - 11 AM at Newcomer - Green Bay Chapel, 340 S. Monroe Avenue. A service celebrating Cal's life will follow at 11 AM. Burial will be at Mt. Pleasant Cemetery in Bangor, ME. Cal wanted to express his gratitude to the staff of Odd Fellow and Unity Hospice for the care given to him throughout his final journey. To leave a memory of Cal or a message of condolence for his family, please click the Share Memories button above. Add your memories to the guest book of Calvin Knaide IV. Many condolences to your family. Cal was a great person and a good friend. We will always remember him. When I met you and Cal I knew you had something very special. May you find God’s love through family and friends during this difficult time. Please accept my prayers for you and your beautiful family Lori. In life we were friends, married 1967-1973, share two children Cal V and Tamara, five grandchildren Cal VI, Vanessa, Tacoda, Cahmon, Aysha and one great grandson Dirk. For fifty two years, though both later remarried we have remained connected. I will never forget your last words to me following a visit to you with Tamara when we were both in Green Bay. "I still care about you kid." Even in your health difficulties you maintained dignity with a smile. I believe when you love or loved in life it is never lost! My thoughts and prayers going out to Cal’s family and friends. Cal has touched so many lives, including mine. There were great memories with him at Oconto Senior High School as an amazing teacher and as my Driver’s Ed. Instructor. Thank you Cal, for being a great memory to my past. God Bless. I know you will be making them laugh in the heavens! We love you so much! Fly high!